Pretty well everyone knows that Modus Operandi makes a good hoppy beer. Their reputation has, for the main, been built upon that; look at the pile of trophies their beers have gotten at competitions since their inception and you’ll find it’s hoppy ones that are responsible for most of them. But the brewery is no one trick pony. In 2016, for example, our NSW panel put forward their assortment of dark beers as some of the best new beers in the state. Then there's a beer like the Silent Knight Porter which has as many accolades at major competitions as any other. So, yeah, they can do a good dark beer too. The thing that for a long while was missing from these two distinct threads was something in between, something both hoppy and dark. That hole got firmly plugged with the Cascadian Howl black IPA. While it’s really very dark, the deep roast characters have been kept well short of charring. That leaves room for the citrusy and resinous hop characters to become resplendent, while the bitterness is generous without overpowering. 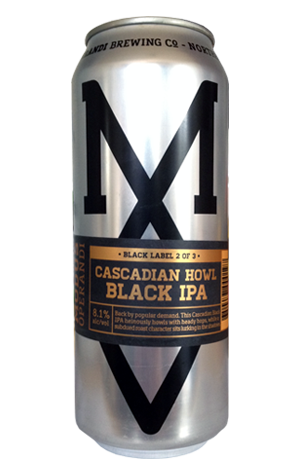 Cascadian Howl was first released at GABS where, even in a field full of the boldest flavours you could expect to find in a beer (and plenty you wouldn’t), it has the richness to stand out. It’s a bold beer but there are no gimmicks here, just a generous but judicious use of malt and hops. A little over a year on from its original release – a year in which it took top spot in our mid-year Best New Beers round up – Cascadian Howl was, according to those working at the coalface in the brewery, by far the beer that regulars most wanted to see brought back into the range. The brewers duly obliged in time for the MO's fourth birthday, with more or less the same recipe and the same delicious results. It's one of three beers released in the "Black Label" series, including longstanding cult favourite, the Silent Knight Porter, the first time that beer has been canned.